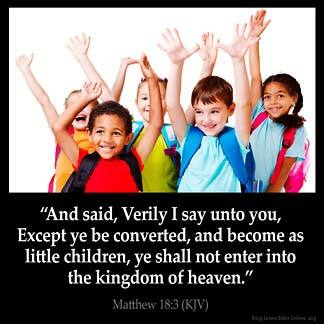 MATTHEW 18:3 KJV "And said, Verily I say unto you, Except ye be converted, and become as little children, ye shall not..."
And said, Uerily I say vnto you, Except yee be conuerted, and become as little children, yee shall not enter into the kingdome of heauen. And said, Truly, I say to you, If you do not have a change of heart and become like little children, you will not go into the kingdom of heaven. and seide, Y seie treuthe to you, but ye be turned, and maad as litle children, ye schulen not entre in to the kyngdom of heuenes. 18:3 Except ye be converted - The first step toward entering into the kingdom of grace, is to become as little children: lowly in heart, knowing yourselves utterly ignorant and helpless, and hanging wholly on your Father who is in heaven, for a supply of all your wants. We may farther assert, (though it is doubtful whether this text implies so much,) except ye be turned from darkness to light, and from the power of Satan to God:, except ye be entirely, inwardly changed, renewed in the image of God, ye cannot enter into the kingdom of glory. Thus must every man be converted in this life, or he can never enter into life eternal. Ye shall in no wise enter - So far from being great in it. #Matt 19:14|. Mt 18:3 Except ye be converted. The Revised Version translates, "Except ye turn", which is correct. The Greek word "strepho" translated in the Common Version "be converted" is found in the New Testament in the active voice in every instance but one, and means "to turn". It means something that the subject is "to do", not something that is to be done for him. Become as little children. Humble, teachable and free from selfish ambition, like little children. Ye shall not enter into the kingdom of heaven. Instead of discussing who should be greatest in the kingdom of heaven, they had better inquire whether they were going to get in at all. Suffer the little ones, they carry the cross with humbleness and soon forget the pains and rebuke and move on, while adults are so full of questions, "why God...... "
wesley's notes:ye being ignorant,I think that this really helps to explain the verse. Ben Weaver's comment : Well said !!!! ego, pride goes before a fall : That is why man fell in the garden. And passed on to us. So let us pray to be like children. My attention is drawn to the word "kingdom" rather than heaven itself. The kingdom of a government is the domain or realm that is subject to - and benefits from its supremacy. Therefore, one could be "delivered from the power of darkness and translated into the kingdom (of heaven)[Col.1:13]" while still living in this life. Isn't Jesus saying, "To be truly great, one must be converted in attitude, from this world's manner, to relying on Him, like a little child relies on its parents. The adult ego tends to hinder true greatness.